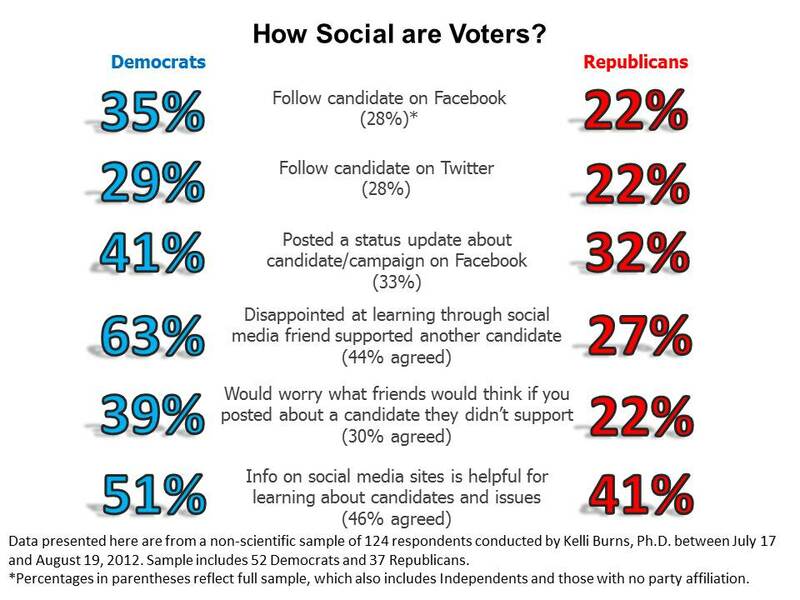 When it comes to politics, how social are social media users? – Kelli S. Burns, Ph.D. When it comes to politics, how social are social media users? The full potential of social media is achieved when users not only effectively disseminate messages to their followers, but also inspire their followers to share messages within their networks. The presidential campaigns of 2012 are tapping into this power by creating presences on Facebook and Twitter, building networks of friends and followers, and distributing content that can be passed along from these friends and followers into their extensive networks. I conducted a small study to explore social media behavior of voters, specifically to understand whether voters were following the candidates, sharing campaign content, and talking about the campaign online. Furthermore, I was interested in attitudes toward political discussion and sharing that occurs in social networks and attitudes that might potentially hinder the sharing process. I used my own networks on Twitter and Facebook to survey 124 respondents between July 17 and August 19, 2012. The sample can be described in the following way: it had more women (74%) than men (26%); the majority were Floridians (62%); the sample was almost evenly distributed into three age groups of 18-24 (32%), 25-34 (29%), and 35-44 (28%); and the highest percentage of respondents were Democrats (43%), followed by Republicans (30%) and Independents (16%). Almost 93% said they were registered to vote, and 90% said they planned to vote. Slightly more than 82% said they had already decided the candidate they would support in the election. Slightly more than 28% of respondents follow a candidate on Facebook and the same percentage follow a candidate on Twitter. Almost 90% of respondents have noticed political discussion on Facebook. When it comes to their own profiles, slightly more than 26% have shared political content that was created by a campaign or someone else, such as a photo, video, or graphic. More than 33% have posted a status update about the 2012 election or a candidate on Facebook and slightly more than 16% have tweeted about the election or a candidate. Almost 45% have commented or liked a friend’s Facebook post about the election or a candidate. been disappointed to learn through social media sites that certain friends do not support a candidate they support. Almost 42% either strongly or somewhat agreed that they don’t like to see posts from friends about a candidate they don’t support. A lower percentage (30.1%) either strongly or somewhat agreed that they would worry what people would think of them if they posted on social media sites about a candidate their friends don’t support. Only 27% either strongly or somewhat agreed that they like to share political views on Facebook, even though 66% either strongly or somewhat disagreed that social media is not a place for political discussion. The data revealed some interesting trends when answers from the 37 Republican and 52 Democrat respondents were compared (see chart). Overall, Democrats were more active than Republicans in following and posting about candidates and the election. They were also more concerned with finding out a friend supported another candidate and what friends would think if they posted about a candidate their friends did not support. Finally, there were differences between Democrats and Republicans in terms of the usefulness of the information they see on social media sites about the election, with more Democrats than Republicans noticing useful information. The presidential campaigns of 2012 have embraced social media and are leveraging its power to attempt to turn followers into voters. People need to feel comfortable with sharing political content and opinions in social media for it to reach its full potential for presidential campaigns. These data show high recognition and perceived usefulness of political discussion and content on social media sites with a lower, yet still encouraging, prevalence of following candidates and commenting, liking, and posting about candidates and the election. Some voters, particularly Democrats, have been disappointed by the postings of others and may hold back because they worry about the opinions of others. Social media is a new phenomenon in politics, but its a powerful new medium fraught with pitfalls. It’s clearly changing the way a new generation shares political ideas, and it’s important for researchers to chart how these changes alter how we relate to each other in real life.